Blanc des Vosges is proud to present printed and jacquard woven bedlinen collections in 100% cotton, cotton percale and cotton satin which reflect a wealth of lifestyles marrying emotions and trends. This design in jacquard woven satin of exceptional quality (280 TC) gives a superbly soft and light handle bringing maximum comfort. Jacquard woven satin also guarantees a high level of durability. Pearlescent mosaic to amaze us…. Evoke all the tenderness of a particular moment in time …. 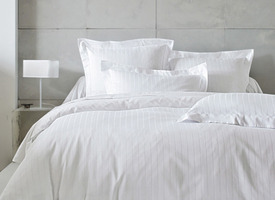 A particularly tight weave gives added softness and comfort to this printed cotton percale in a 200 TC.